How is a successful transit project designed and implemented? In the past I’ve complained bitterly about a St Paul project that went badly and praised one that seemed to be going well. The difference? Primarily, it’s about engaging the public and making sure that everything is accounted for. Today I am a representative of the Fort Road Federation on the Technical Advisory Committee (TAC) for the Riverview Corridor. In the interest of practicing what I preach, here is a full disclosure of what we will do and how I am approaching it. I value your comments, regardless of whether you live in St Paul or somewhere else – everyone has something to add to big, expensive projects like this. The Riverview Logo. Yes, it’s a train. 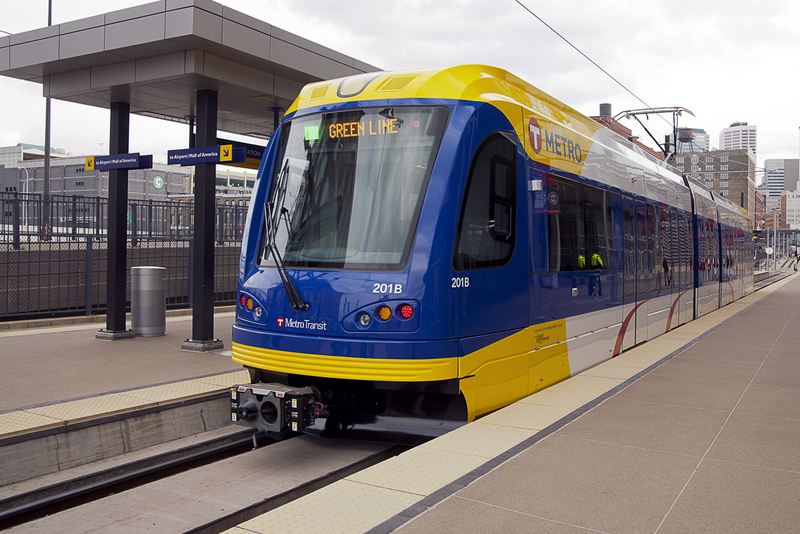 The project itself is about connecting Union Depot in St Paul to the Airport and Mall of America with transit. Theoretically, we will be looking at all options, but as you can see in the logo for the effort the image of a train was chosen. Yes, Light Rail Transit (LRT) is going to be favored. There are four logical places where a train (or anything else) can run – I-35E, West Seventh, Shepard Road, the existing train right of way for the Ford Plan Spur, or some combination. If you assume LRT, the real bogey is to run from Union Depot to the point where the tunnel runs under the Airport on the Blue Line (Hiawatha), a distance of about seven miles. You can see this on the map of the study area. The current transit option is the 54 Bus, which takes 30 minutes to make this trip during the day. Note that there are no good options for running a major new improvement through this built-up urban area. No matter what, this has to cross the Mississippi River. It also has to deal with existing properties, historical sites, and important natural features. The Green Line, both local and through train – and ultimately neither. There is also the tension that is present in any transit project, which is determining whether it is about moving people through this corridor or serving the local residents. Attempting to do both, as was done on University Avenue, usually winds up serving neither particularly well while running up the tab tremendously. Anything on Seventh has to unite, rather than divide the street, through the entire length. It has to serve the businesses and residents on the street and draw people together, not serve as a barrier that we have trouble crossing. The Mississippi must be respected. This includes the natural world as well as the ability of residents to be a part of it where appropriate. The first principle addresses the problem posed by the last system proposed through the corridor, which was a dedicated busway down West Seventh separated by walls. We can’t have that in a narrow urban street (80 to 100 feet wide) with businesses and residents on both sides. 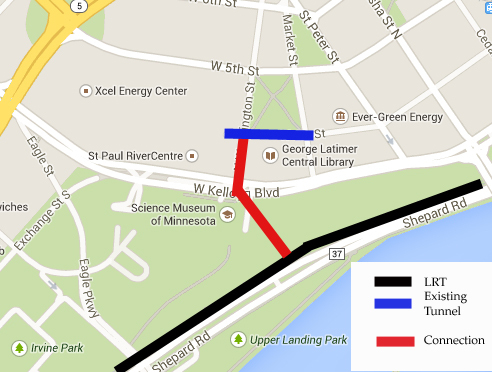 A quick map of a possible Xcel Center station. The second principle is about making connections everywhere, and ideally that will make use of the vertical elevations that define this neighborhood whenever possible. For example, I can envision a stop for the Xcel Center (home of the Minnesota Wild) along the railroad tracks that connects directly via an extension to the existing Skyway tunnel that pops out of the bluff beyond Kellogg. This could also be how an LRT line along existing track right of way connects the three blocks to transit along Seventh Street, be it a bus or a Streetcar. The last principle speaks for itself. Running this along the Mississippi (re: “Riverview Corridor”) has the potential to cut the neighborhood off from our most important asset. So far, the Riverview team has done little more than gear up for public input, much of which will come at two open houses that they are hosting. I plan to be there and listen more than anything else. This is very important. The ADM Elevators, a small part of about 5 acres of potential redevelopment. The land use and economic development pieces already clearly favor the old industrial sites located along existing train tracks. 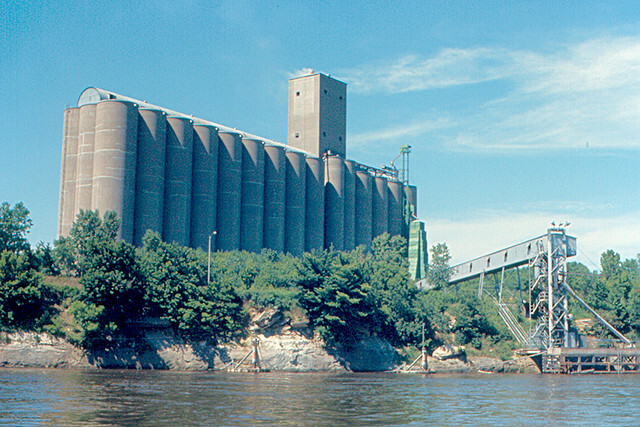 This includes the old shops of the Omaha and Western Railroad, long abandoned, at Randolph and Shepard – along with the operating ADM grain elevator. But there are other sites along this stretch that make it particularly attractive by the criteria given. Note that while this study has precluded the study of a streetcar or bus improvements on West Seventh, it doesn’t end them. Creating a high speed through line along existing trackage and/or Shepard Road cries out for a local service along Seventh that connects to the high speed line. The connections become critical in such a system, which is why I’m already focusing on how connections generally can be improved by this project. But it’s important to not get too far ahead of the project at this time. This is when we need public input more than anything else. While there are a lot of good ideas and obvious biases related to this project, they have to be evaluated based on what will serve people the best. That’s what matters most when spending a very large amount of public money. What do you think? All comments are most welcome. We’re just getting going on this thing and every bit of input helps. This entry was posted in People & Culture, Urban Life and tagged LRT, minnesota, planning, Riverview Corridor, St Paul, transit. Bookmark the permalink. We need this very bad. It is very wrong that St Paul has been left out of transit so much and if this is our chance to get back into the process we have to take it. 7 miles is not long at all & it should be easy to run it on the tracks that are along Shepard Road most of the way. Is there room? Maybe, is all I’ll say now. I favor the existing tracks at least as far as we can run it on them, but I have to keep an open mind. As a homeowner immediately intersected with 7th, I would like to see streetcars on that street to maintain the historic integrity of the neighborhood. Light rail along existing train tracks and through industrial sites with less intrusive connection methods seems the ideal proposal in my opinion. Thanks Erik – your insights are always helpful to frame the discussion. I think that what has not yet been clearly articulated is the question of “what problem are we trying to solve”. There are various solutions possible, each with different levels of impact and price tag and I think public support will hinge on a clear understanding of the why, and then whether or not the solution seems like a reasonable response. Yes, what problem are we trying to solve? The short answer is congestion and barriers to continued growth, but that needs a lot more refinement. We also feel a need to improve the connection to downtown St Paul generally. Congestion? Well, to my mind that points to the Xcel Center more than just about anything else on the street, which is why I included the drawing I did. We very much need to define what problem we are solving first. A good point. Light rail in the corridor brings the closure of the Metropolitan transit triangle in one mode for all three legs of the triangle. Another take on ‘what problem…” is that the study appears to have skipped the question of where the closure should occur. 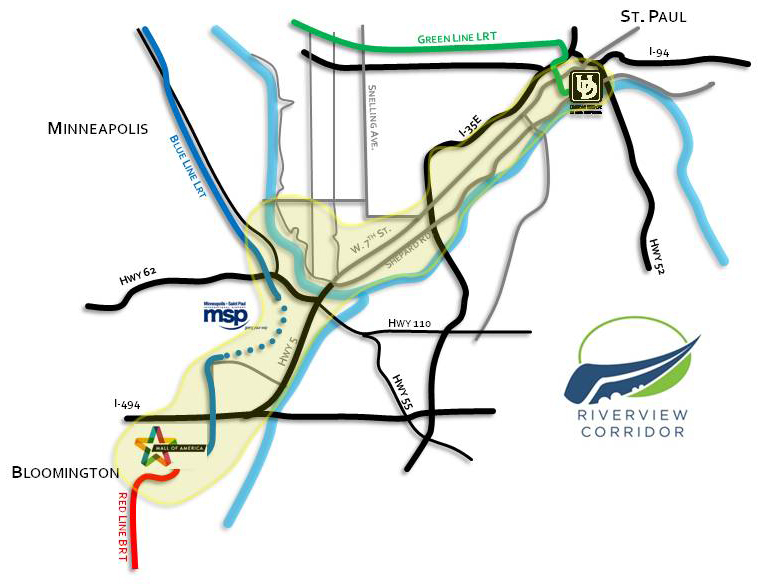 The path of closure of the transit connection from downtown St. Paul to the Megamall was made before this study was started, in that it appears to be presumed the best path is in the River Corridor. I am looking for when this question was answered. One aspect of this corridor route is a potential squeezing of the land coverage area of a route to Ford and the doubling up of LRT route from essentially 42nd and Hiawatha to the Megamall. This does not seem an efficient use of the investment. A new bridge in the area of Hwy 5 would mean from Bishop Whipple to the Megamall, Not much different. Might it be a better use of resources to close the loop by going south across the river and then west on 110 or another corridor. This would be more expansive and inclusive of land area for a wider transit system where trains would be cheaper to construct with more space available etc. I have ALWAYS thought that the Ford Spur all the way to that redevelopment would be a great idea. Having said that, the Mississippi crossing becomes not only longer but more difficult – with a need to avoid Minnehaha Falls and the Veteran’s Home. So it’s one thing on the list to think about. It might be a brilliant idea, it might be a terrible idea. I would point out that if your transit route options are poor, communication or design and good implementation may not be able to overcome the real problems inherent or created by the solution proposed. But I’m willing to consider all options and have not made a personal decision at this point. I hope neighbors will take an interest and engage the process as much as possible. I worry that In the case of LRT at the river, the transit people will end up with a route with limited stations that are cut off from the local people by current barriers, bluff, existing rail, maybe Shepard Rd. while at the same time the LRT cuts people off from the river which stops the great plans of GRP in its tracks. Pun intended. Realize that the LRT right of way will have two fences for safety that will run end to end of the corridor with no openings except at the stations. That is a real barrier to the river. I would refer anyone that is interested to check out the National Park Service comments in the 2000 study report regarding the environmental effects of transit in the river valley. What Eric says is a good start of the conversation and I appreciate these thoughtful comments. I am just not sure the RCRRA study conclusions, which could be biased to a regional solution, would come up with or be able to implement the transit solution(s) needed in the neighborhood. Problem is that a majority of the votes on the PAC are not of the neighborhoods affected. Two votes are from Bloomington where not a single foot of new track or transit path will be implemented. This is in part why the Community Reporter in it’s September issue editorial called for more open meetings at the TAC and PAC etc. Public input meetings coming are a step in the right direction to assure that all options are actually on the table and get full consideration. I was the only member of the public that attended yesterday’s TAC meeting. I would invite others, they are now open to the public as a result of those editorial comments by the Community Reporter. More still needs to be done get a transit and open process. Given my experience with advisories these last three or four years and how they work, I am very skeptical that the apparent mode chosen by planners can be modified by this advisory to what the neighborhood wants. This is really a second study bite at the apple following the first in 2000. The questions are essentially the same then and now. Some things have changed in the last 14 years. The city has rediscovered it’s links to the river and I believe the city and the neighborhood want the conceptual Great River Passage ideas that are also adopted in the City Master Plan. Population and transit needs are evolving. Is this a transit project or should it try to be both transit and development project. Planners tell us it should be both. Eric’s emphasis seems to be calling for a more clean transit project. The near downtown has many properties that are historically important if not designated that along with the predominate small and local business character along W7 and the strong single family housing preservation near downtown exemplified by work in Little Bohemia all speak for careful consideration of a transit project and it’s effects. The concern that Eric expresses that the neighborhood should not be, once again, divided is very real. The neighborhood before it was a neighborhood was divided naturally by the bluff causing most of it to be located on the bluff while portions in the valley were ultimately removed. The 19th century brought railroad development in the river valley. The 20th Century brought Shepard Rd. and 35E that also bisected the neighborhood. We should not accept a new 21st century barrier division of the neighborhood, at the river or anywhere else, that just solves a regional transit problem. Thank you, Kent. Eloquent as always. This will be a long process. There is no need to rush to an answer. I’m excited to learn about this web discussion. An improved transit connection from downtown St Paul, down 7th or Shepard Rd, to/from the Airport seems to me like the most obvious and important transit update for this metro area. It would complete the triangle of the current blue line (Hiawatha Ave) and green line (University Ave). It should happen sooner rather than later. But of course after valid input from those most affected. Something good will happen, one way or the other. But this is still years away, sadly. You didn’t say anything about the cost. This sounds like a shorter route than we did before so I would hope it bucks the trend of every higher price tags. We have no idea what the cost might be – there is no design to price out and we aren’t even close. With any Mississippi bridge I would ask you to not hold your breath waiting just yet – it will be a big tab. I do hope it’s less than $1B, yes. Personally, I’ve liked the idea of LRT starting at the Green Line’s central station and running west on 5th St along the north side of Xcel to 7th. (Of course, 6th St would have to be converted to two-way traffic) From there, you could either follow 7th or Thompson / 35E south to roughly Western, then jog down to the freight tracks. That avoids the tightest part of West 7th. This is an interesting suggested path. I would like to see it on a map, where problems are solved or created would be more obvious. It’s jogs and turns illustrate the difficulty in finding a path for LRT through the West End. It seems every path that has been suggested so far has significant problems, not the least of which is ownership and conflicts along the CP rail path. Since cost seems to be no problem, perhaps boring a subway through the limestone would be possible, but that isn’t one of the suggested study alternatives. I would like to see more discussion of the streetcar and BRT options as less costly. It is interesting that the Gateway Corridor study chose BRT as the best option. It also had a Community Advisory Committee (CAC) as a part of that advisory. This River Corridor Advisory doesn’t have that CAC, offering less opportunity for constructive community input such as this by Mike. The Community Reporter in the interest of more public input called for this CAC in it’s Oct 1 issue to be a part of the study. Study leaders so far have ignored that suggestion. There are many reasons why I do not think LRT should be run on city streets other than to make a quick connection. One is the terrible cost, run up by requiring utilities to be moved. The other is the space it takes up, which is tremendous. Lastly, it was designed for high speed (hence the weight and cost) and running it at 35 MPH is a terrible waste. City streets are generally much better served by streetcars, if your goal is local service. Also, keep in mind that we have service to the airport right now that takes just 30 minutes. That’s the mark we have to hit. A line on city streets is not going to be a net improvement if the goal is to get people to and from the airport. Seems to me that West 7th is always very congested while Shepard Rd appears to be under utilized. Perhaps there is someway to have Shepard connect smoothly with the Hwy 5 bridge instead of that tight clover leaf on-ramp (they need to fix the tight cloverleaf on-ramps on 55 on the south side of the Hwy 5 bridge, rebuilding the Mendota bridge a couple hundred feet further south might solve that issue). Meanwhile turn West 7th into a business corridor with only 1 lane of traffic each way and maybe no direct connection to the Hwy 5 bridge (save the LRT connection and an on-ramp). This would require a new bridge probably with a tunnel that drops below the parkway, it would also be nice to include bike & pedestrian lanes on the new bridge for access across the river to Fort Snelling and the park below (the current access is insane, involving long stairways). You’re a sharp guy! The city is already looking at how to connect Shepard to the Highway 5 bridge. How good the connections will be for bikes and pedestrians in any new bridge is also being considered. I like the idea of 3-laning West Seventh the whole way as well, and with any options for transit improvements I think we can also improve the flow of Seventh in part by making it more of a local street. So you’re right in the mainstream of thought here, and something like what you say is very likely all around. I hope we can make it happen!